A video series and installation exploring Baltimore's invisible sites. Friday, April 24, 7 p.m. – 12 a.m.
Share Baltimore’s enduring strength as it struggles to survive top-down schemes of superblocked urban renewal. On this tour we will explore the specter riches of defensive architecture, campy Formstone facades and invisible sites of history and resistance. Share your own personal insights as we discover how capitalist speculation continues to harm the Westside while everyday people resist through small-scale entrepreneurialism, art and direct action. All tours are free and open to the public and meet at Current Space, 421 North Howard Street, Baltimore, MD 21201. We walk for 45-60 minutes at a moderate pace. Voluntary physical activities include climbing stairs, laying down, and stepping over obstacles. In collaboration with ICA Baltimore, public artist Graham Coreil-Allen presents SiteLines, a multimedia collection of online videos, experimental walking tours and an immersive art installation at Current Space featuring banners, photography, typography and cartography derived from nearby invisible public spaces. 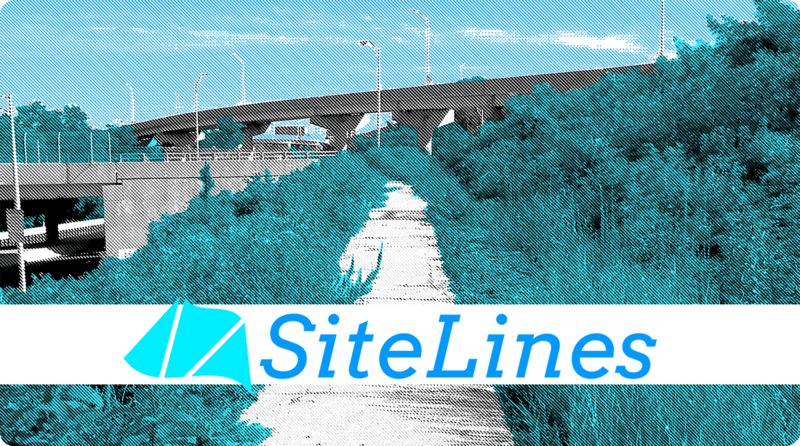 Sitelines is a translation of Coreil-Allen’s New Public Sites walking tours into video web series capturing the artist and walking tour participants as they playfully explore public space while he shares the sites’ histories, design, and uses. The ongoing New Public Sites project interprets the overlooked and invisible sites within cities, investigates the negotiable nature of public space, and pushes the boundaries of pedestrian agency. Filming for the first season of SiteLines began in September 2014 with four tours: Crossing the Highway to Nowhere, Reservoir Chill, Old Town Walking Revival and Power Plant Alive! These collections of new public sites are connected by suburban style development in an urban context, including freeways and pedestrian malls. Videos from these walks will be incorporated into a larger installation of banners, photography, typography, found object sculptures and a gallery-size map at Baltimore’s Current Space, opening on April 24. During the course of the three week exhibition, Coreil-Allen will also lead three walking tours in collaboration with additional artists working in the surrounding Bromo Tower Arts & Entertainment District. All tours are free and open to the public.